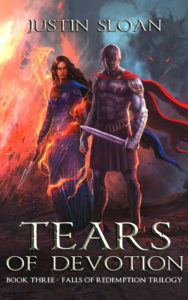 For anyone who likes dragon shifters, epic fantasy, and crazy action, here’s some more from TEARS OF DEVOTION. Book 1 (Land of Gods) is now in audiobook, so I want to share some of this one – probably my favorite book written to date. The sun hit the grass of the cascading hillsides in front of Lome as he approached the village walls. Shadows stretched over the bricks, concealing the cracks and crevices in the path. From the top of a hill, Lome saw the village rising up along the mountain behind the walls. He could barely tell where the buildings stopped and the mountain rock began. Warm air emitted from the walls like a blanket cast from the mountain to cover the earth below. Lome stopped to figure a way into the village, only then seeing the archers’ turrets and at least one pair of eyes staring down at him from above. A great drawbridge was pulled up, forming a flat surface with its cut rock supports. His instincts told him the walls should be centuries old, but they seemed pristine to the eye. Lome looked over it all with a hesitant thought to his past, a memory never there but never gone, from some other life perhaps. The shadows had almost engulfed him now, though the sky seemed stuck in its yellow and orange transformation. As he passed a small vase overflowing with water, he heard an arrow being nocked into its bow. As Lome returned no reply, a young man’s face poked out from a murder hole along the wall, his longbow aimed at Lome’s head. Lome considered the new name, figuring it was more likely his than Lome. At least, this man seemed to think so. The man motioned again. “Thank you,” Aldrin, formerly Lome, said. He entered, slowing as he passed the guard, part of him suspecting a trap. But the guard simply closed the door behind him and smiled. “You had us worried,” the guard said. “You’re not the only one,” Aldrin replied. The man motioned for him to follow, then turned and quickly disappeared into the shadows. Aldrin looked around and followed, ducking his head to avoid the low doorway. He was not short, but he certainly wasn’t tall enough for crouching through a door to be normal. Aldrin looked from his blue rags to the white robe wrapped around the guard. Aldrin stood still, confused. What made it so unsafe out there? But he figured it better not to ask, for they seemed to know him and he wasn’t sure if he wanted to give up the fact that he’d lost his memory. Not yet, at least. “How could I?” Aldrin said in complete confusion. A small mud-brick house appeared before Aldrin, and Mirdal soon had him in one of her husband’s robes. Aldrin looked at the brass shield serving as a mirror on the wall, staring at the cloth hanging loosely around his limbs. “Aldrin, let’s go!” Tandiar called out. He stood in the doorway, having changed into a chartreuse toga that fell to the leather-laced boots on his feet. Over his shoulders, he wore an animal skin, although Aldrin wasn’t sure from what animal. It was almost enough to make him laugh, if it weren’t for the fact that the two were now dressed in a very similar fashion. “I suppose I’m ready,” Aldrin said. Tandiar took Aldrin by the arm, and they laughed as they walked through a low hallway, although Aldrin was only laughing along so as not to seem odd. A breeze blew through the toga he now wore, and he became acutely aware of the lack of undergarments beneath it. The streets had mostly emptied in the time it had taken to prepare for the date, but oddly, the sunset seemed to have not changed one bit. Groups of men and women sat smoking pipes in front of quiet inns, and a pleasant cherry scent carried with the wind. Aldrin decided he’d best not act suspiciously, so he simply nodded. They passed under a bridge, and the path led them around a bend in the road. Soon they came upon a stream, which they had to step over. Windows were barred in the houses along the path, and more than once Aldrin noticed guards watching people suspiciously. “What are they watching for?” he asked, with a nod toward two guards passing by not far off. They wore the same blue and purple robes the other guards wore, curved swords tucked into their sashes. “Are you mad?” Tandiar asked, making a point to look straight ahead. The response was enough of an answer—don’t give the guards a reason. The ensuing awkward silence was soon over, to his relief, when Tandiar stopped at a low doorway framed by white curtains. He walked away, still shaking his head. This left Aldrin with nothing to do but enter through the door and see what sort of woman was awaiting him. The door led first to a long hallway, with a cobblestone floor much like outside, and more white cloths draped throughout and hanging from the ceiling. As he went farther along, the sound of people talking met his ears, and then dishes clanging. Was that a lute? The hallway came to an end, bringing Aldrin to a room full of people. A fountain stood in its center, presided over by a statue of a dragon. Everyone was dressed just like him, and barely anyone seemed to notice his arrival. Well, anyone except for the beautiful girl with the round, brown eyes. He took a step closer and she smiled, so he continued. “You must be Platea?” he asked. He took the seat across from her and stared, wondering how it was that she so surely knew him. “Oh, don’t be silly,” she said with a sideways, nervous glance. He followed her gaze and saw soldiers along the walls, a few tables of people between them and him. The two stared at each other, and as each second went by, her brow furrowed further. “God, you really have no idea,” she said. She definitely looked ill, but Aldrin had to keep the conversation going. He had a goal. “I need to get up the mountain,” he said. This time she gasped, a hand to her mouth. A couple of the people nearby had apparently heard, because they were glancing over as well. She kicked a table over, inciting shouts from the nearby customers, then ran for a table by the wall which she used to jump up and through the window. Aldrin followed close behind, but someone grabbed his foot. He was yanked back and found a soldier’s face inches from his own. “I don’t know what’s going on!” he shouted. The soldier was about to respond, when a rock hit him on the head and he staggered back, releasing Aldrin. Platea appeared in the window with a second rock, this one for the soldier running at Aldrin’s other side. “Hurry!” she shouted, and so he did. Before the soldiers had time to realize what was happening, Aldrin and Platea were long gone. Platea led the way down the alley and then motioned for him to leverage an overturned cart so they could jump up onto a roof, and then climb over its edge to hide. He made it behind her as more shouting sounded below. “Mind telling me what in the world’s going on?” he asked. “Your bet’s as good as mine.” She took off at a crouched run, and he followed again. She stopped at the edge of a roof, eyes searching like a hunted rabbit. “Because you’re an idiot.” She ran and jumped to the next roof over, then waited for him to do the same. “I’m not jumping across that!” he said, his voice rising higher than he meant it to. “Up there!” a gruff voice yelled. Platea gave Aldrin an exasperated look and then took off running. Jumping to the next roof, she rolled and then lowered herself over the far side. He had no choice but to follow—it was that or wait and ask the soldiers why they were after him, and something about that seemed like a bad idea. Three long strides brought him to the edge of the roof, and he pushed off with all his strength. Surprisingly, he cleared the gap with no problem. He didn’t hesitate as he quickly lowered himself over the edge. He was relieved to see Platea waiting at an open window. The two ran down the stairs, to the back door, and then sprinted across a small field to another house. This one had a locked door, but she climbed through the window and led him to a tapestry on the wall. He couldn’t help but pause at the sight of the tapestry—a picture of a boy’s body with a goat’s head. “Is that reminding you of something?” she asked as she pulled the tapestry aside to reveal stone steps leading down. He was about to say no, when his mind was overcome with a memory. Blood, a slicing sword, and spears everywhere… Then everything went black. FROM JUSTIN >>> Having a fun time trying to figure out how this fits into the rest of the story? Ooooh, I hope so – it’s a doozy. Good times. Anyway, we’re almost finished with the cover for my first Age of Magic book, and a portion of the draft can be seen now as my Facebook page pic – www.Facebook.com/JustinSloanAuthor. Come like the page so you don’t miss anything. And for my dragon shifters military fantasy book, head over to Amazon.